CEO Luncheons are held four times a year and feature a top executive of a Conway-area company as a guest speaker. Attendees gain insight about the featured company, network with other professionals, and enjoy a plated lunch. 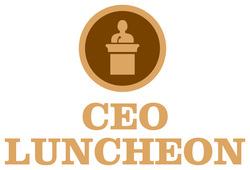 CEO Luncheons are open to all employees of Chamber-member businesses. Individual tickets are $25 per person. Reserved tables of eight are available for $200. Our first CEO Luncheon of the year will feature Matt Troup, President & CEO of Conway Regional Health System.